I hesitate to call things that aren't puppies or babies "cute" or "adorable" because I feel that those words are generally used patronizingly, and I don't mean to describe the affection that Manchester, New Hampshire and the surrounding environs have for their native football sons in a demeaning way. So instead I'll say that it's inspiring how attached the area seems to be to the likes of Dan Mullen, Chip Kelly, and of course Ryan Day and their success on the football field. While doing (a small bit of) research for this particular missive, I came across article after article after article after article (after article, etc.) from local New Hampshire news outlets hailing the hiring of Ryan Day as Ohio State's head football coach as the greatest thing since sliced bread and/or the polio vaccine. These articles often describe Day with breathless praise, digging for comment from every single possible source to expound on just how fantastically freaking awesome the new head coach of Ohio State was and is. Day’s resume includes assistant coaching stints with Boston College, Temple and Florida universities, and the Philadelphia Eagles and San Francisco 49ers in the NFL under Kelly. But all that was after the Little Green at Central High School, where he was quarterback from 1993 through 1996. “He was beyond his years as a high school quarterback. Extremely intelligent about the game,” said Jim Schubert, the former Central High School coach who won his first state championship with Day at quarterback. According to a newspaper article at the time, Day set New Hampshire records for career yards (4,099), touchdown passes (57) and season yards when he wrapped up his football career at Central during the Thanksgiving Day Turkey Bowl in 1996. He was named New Hampshire’s Gatorade Player of the Year that year. “He was definitely a leader. He was 10 steps ahead of where the team was when it comes to game prep and how to look at the game,” said Matt Pinkos, who played alongside Day at Central. He predicted Day will be fantastic at Ohio State. 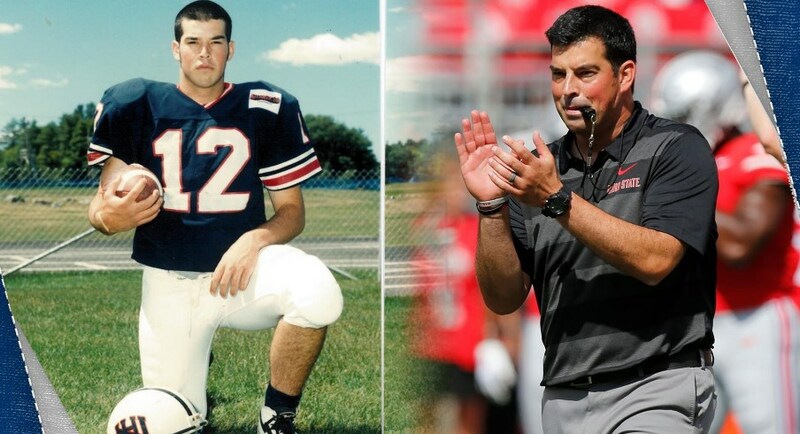 Here's the thing: I, a native Ohioan, Ohio State alum, and lifelong Buckeye fan, do not care one whit about Ryan Day's high school football career beyond the oddity that he's from New England insofar as it relates to Day's ability to coach football. I didn't know what the hell a Thanksgiving Turkey Day Turkey Bowl was until I looked it up (apparently it's a crosstown high school rivalry game played in Manchester every year). But to people in Manchester, all of that is part of the general pride they feel about one of their own making a mark on football. I got a similar feeling at the dedication of the statue of Woody Hayes that Eleven Warriors helped erect in Newcomerstown this past summer. A small town taking enormous pride in a singular person might seem quaint, but it's not: the coaching legend that Woody Hayes became was a product of all of the influences in his life, and that has to include where he was from. Newcomerstown deserves to be able to take pride in the man they helped build up. And to be completely fair, it isn't like Manchester is some ruined hamlet on the edge of space: it's a thriving city of more than 100,000 people that has produced comedians like Adam Sandler and Seth Meyers and Sarah Silverman, and more relevant to us, football coaches like Dan Mullen (who was born in Pennsylvania but won a state championship as a high schooler there) and Chip Kelly (who, of course, helped launch Ryan Day's career as his college coach at the University of New Hampshire and as the head coach of the Philadelphia Eagles). Ryan Day, Manchester, Boston College football. A former standout quarterback at Manchester Central and the University of New Hampshire, Day has already coached for a dozen years in Division I football and been part of seven bowl games. As Ohio State fans we become numb to excellence. Because it's expected, it becomes less impactful and therefore less exciting or meaningful. Which is sad, because we forget that as the increasingly final bastion of Midwest college football greatness, we're also incredibly lucky to have the services of people who have achieved incredible things throughout their careers, like Braxton Miller, Jim Tressel, Dwayne Haskins, Woody Hayes, a billion others, and of course new Ohio State head coach Ryan Day. The authentic, genuine, and completely earned love that the city of Manchester has for Ryan Day is a reminder that the People that You Win With don't just spring up from the ground, wearing Ohio State polos. They're all from somewhere, and in that regard the largest city in New Hampshire has done as good a job as any in impacting the sport of football. NFL Draft a Interesting Player .